Pearson Park was established in the early 1860s when Zachariah Pearson, then Mayor of Hull, gifted an area of land off Beverley Road to the local Board of Health. As the first public park in Hull, Pearson Park is a key part of the city’s heritage and still retains many of its historic features including the original perimeter carriage drive, a serpentine lake and seven Grade II listed structures. Whilst the park remains attractive and well used, some of its important historic design features such as the bandstand and the bridge over the lake have been lost over time. Of the historic features that are still in the park, many are now in urgent need of restoration to ensure their long term survival. The Parks for People National Lottery grant scheme funds projects that aim to conserve and raise awareness of the special heritage of historic parks, whilst also supporting the greater involvement of local communities within park activities. The council, as the Trust, was successful in securing a £3m grant from the Heritage Lottery Fund on 17 July 2017 that will be used to rejuvenate the park and protect its important heritage for years to come. As planning permission has been obtained, work is now underway to procure contractors to carry out the restoration works. The works will be managed under two separate contracts, with the first of these focusing exclusively on the Entrance Archway due to its specialist cast iron construction. On 1 October 2018, Lost Art Ltd was appointed as the contractor to restore the Entrance Archway and the team is anticipated to start on site in Autumn 2018. The second contract will cover the rest of the restoration work to be undertaken within Pearson Park, with the tendering process to be launched in Autumn 2018. We have set up a steering group to manage the delivery of the restoration works that is comprised of elected members of the Wyke Area committee and council officers. Building on the successful engagement work undertaken during the development of the proposals, we will continue to engage local stakeholders and residents throughout the delivery phase of the project. The project will be managed so as to minimise disruption to park users and advance notice will be provided where facilities need to be temporarily closed to allow restoration work to take place. Following the granting of Listed Building Consent, the owners of the MacFarlane brand, Hosiers Ltd, removed the drinking fountain bowl in November 2016 to allow for its detailed inspection in their workshops in Glasgow. Once complete, Hosiers Ltd will carry out restoration works on the cast iron structure before re-installing the drinking fountain bowl in the park. This work will be completed during 2017. The restoration of the drinking fountain bowl is outside the scope of the work covered by the Heritage Lottery Fund grant for Pearson Park. This is because the project needed to progress urgently to allow Hosiers Ltd to take castings from our drinking fountain bowl to assist with the reinstatement an identical MacFarlane structure in Jamestown on the South Atlantic island of St Helena. The Pearson Park Trust is keen to support this opportunity to help the national heritage movement and additional restoration work to the drinking fountain canopy will be carried out using the Heritage Lottery Fund grant. The Council has provided information on-site to keep local residents and stakeholders up to date. Please click here to access the Council’s planning portal where full details of the restoration proposals can be viewed. 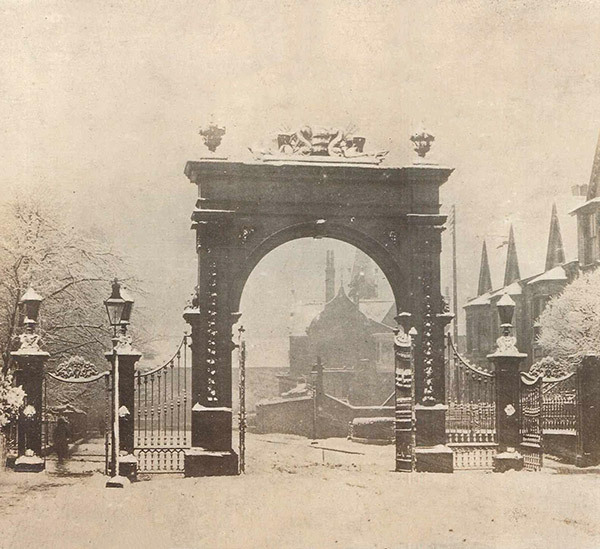 Historic images of Pearson Park are from Stuart MacDonald’s personal postcard collection and shared with kind permission.